This recipe is featured in our 20 Meals from Costco for $150 Meal Plan #1. I love how fast stir-frys come together. Broccoli and Beef is one of my favorite dishes, but I avoided making it for years because I thought the recipe involved too many steps for an easy stir-fry dinner. The recipe I was given by a friend involved cooking the meat in oil, steaming the veggies, cooking both in a marinade and then adding a sauce…just not going to happen on a busy night. Then one evening it occurred to me: I am not a recipe follower! So I used the flavors and created a fast and easy Broccoli and Beef recipe that we can enjoy even on busy nights. You do need oyster sauce when you make Broccoli and Beef, it is the secret ingredient. (Don’t tell your children that the secret ingredient is oyster sauce – that is why it is called the secret ingredient!) In our area a 9 oz bottle of oyster flavored sauce sells for $1.99. I use 14¢ worth in this recipe. It is a fairly inexpensive way to jazz up your stir-frys. After you have cut your broccoli florets, don’t toss the stems! You can julienne the stems and use them to make Broccoli Slaw. Add olive oil and soy sauce to a large frying pan or wok. Add steak, onions and garlic and cook over a medium-high flame until the meat is mostly browned. Add broccoli and carrots. Cook over a medium-high flame for 4 –5 minutes or until broccoli is fork tender and meat is cooked through. Remove pan from flame. In a small bowl, combine water and corn starch until they are thoroughly mixed. Add soy sauce, oyster sauce, rice vinegar, sugar and ginger. Stir until completely mixed. 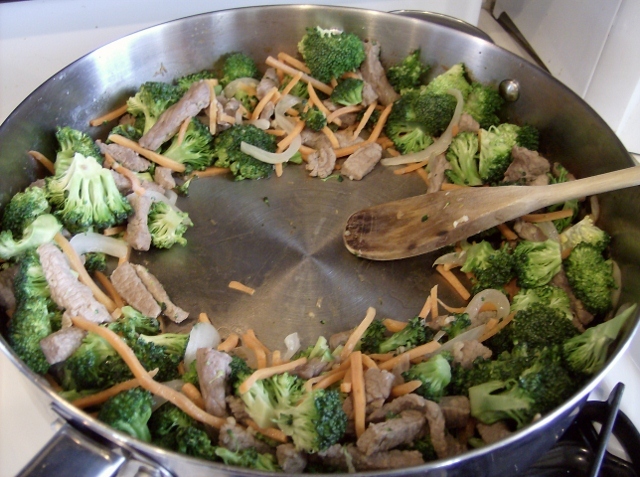 Push the steak and broccoli to the sides of the pan, leaving the center empty. Add the sauce and cook over a medium flame, stirring constantly, until the sauce begins to thicken, approximately one minute. (This sauce is not going to be extremely thick, like the restaurant variation, but it is flavorful). Toss the beef and broccoli with the sauce until thoroughly coated. 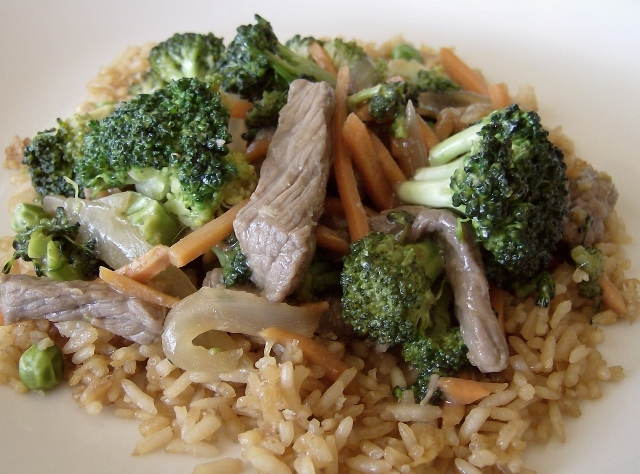 Serve Broccoli and Beef over white rice or fried rice. This recipe is featured on SouthernPlate.com’s Meal Plan Monday #13. Erin, This will not allow me to print. When I hit the print button it diplays a blank page, nor will it allow me to copy and paste. Any ideas? It sounds to yumm yo let it go! Thanks! You can replace the cornstarch with 4 teaspoons of flour and you can use white vinegar instead of rice vinegar. I hope you enjoy the recipe. I used chicken instead of beef and it was still sooooo good! Thanks for the recipe! I’m confused how this is part of the20 meals from costco for $150. It has flank steak which is not on the shopping list. Are we supposed to use stew beef instead? Also, it seems important to use fresh broccoli in this stir fry, especially if wanting to make the broccoli slaw, but the shopping list calls for the frozen broccoli. I’m guessing we’re just supposed to use the frozen though. Sorry, you may have clarified this somewhere, I may not have seen it. But it would be good to know. I made this dish for my family last night, and it is hands-down a new family favorite! We’ll be making this again very soon! Thank you! You made my night! Courtney if you go back to the costco for $15o page and go down to the Recipes with Ingredients Breakdown you will see where she lists what to use from the costco trip. This was great! Made it last night and the family loved it. I am a sauce kinda gal so I increased the sauce, made it a bit thicker and added a little honey. My hubby loves stir fry so was excited when I made it. I used it as part of the Costco meal plan so I used the stew meat, frozen broccoli, and cut up baby carrots for it. You mentioned that this is a freezer pack? how does that work? Sounds like a plan,I am going to try it! Save money! Eat healthy! I like it! I too just realized there are no “FREEZER PACK” instructions per the Costco article. Would someone please clarify?? Thanks. I just made this into freezer meals. I put all the ingredients in step one- the oil, soy sauce, meat, garlic and onions- into a quart size bag. Then the carrots and broccoli in step two into one quart bag (it was a tight fit!) and the sauce mixture into its own bag- I used a quart but a sandwich size would have been plenty. Then I put all three bags into one gallon zip lock bag. That way it is all ready to go when I want to cook it and I can still follow the cooking steps. I am not sure how else to make it a freezer meal. It smells and looks good!! I had enough ingredients to make 4 meals. Thank you for posting these meal plans- it makes my life a little easier!! Having lived in Hong Kong for 13 years I can say that you have a very nice western / eastern dish – I just tried it with some left-over, thinky sliced roasted tenderloin ( which just melts in your mouth) and its delicious (and used up the extra portion of saffron rice from Friday night’s Indian take-away! Just needed to add a little water to the wok as the sauce got a little thick and started to go dry.